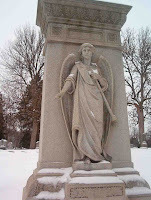 Angels are considered spiritual beings that guide and protect mankind, while interceding for him in heaven and acting as the messengers of God. 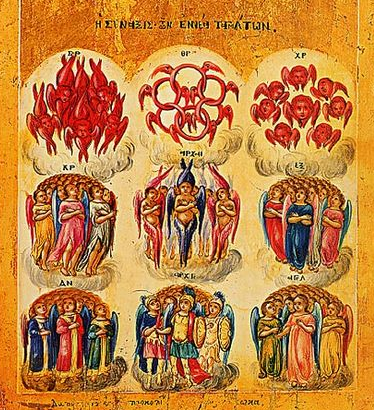 There are nine levels of angels with 3 types in each group. The Christian hierarchy is, from lowest to highest: Angels, Archangels and Principalities; Powers, Virtues and Dominations; Thrones, Cherubims and Seraphims. 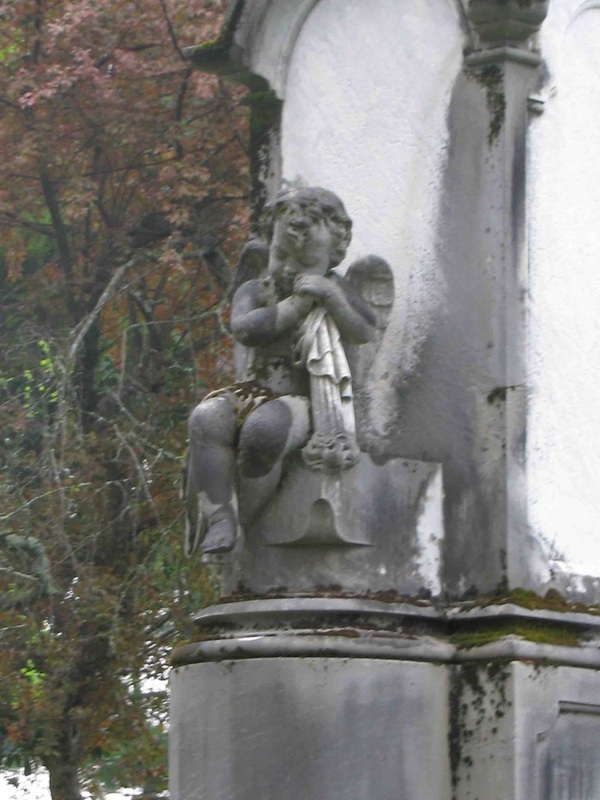 Statues of angels, archangels and cherubims (actually Putto) flourish in cemeteries around the world, watching over the graves of children and adults, alike. The belief in angels has existed since ancient times. 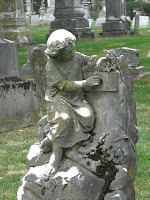 Folklore and legends from around the world have numerous stories involving angel and human interaction. 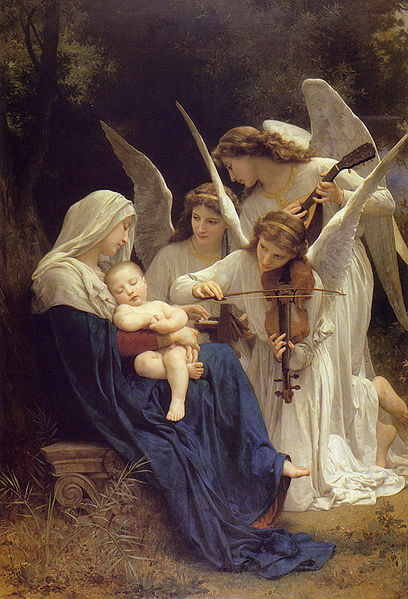 Most world religions that believe in one god share a belief in angels such as Judaism, Christianity, Islam and Zoroastrianism. Most eastern religions do not. 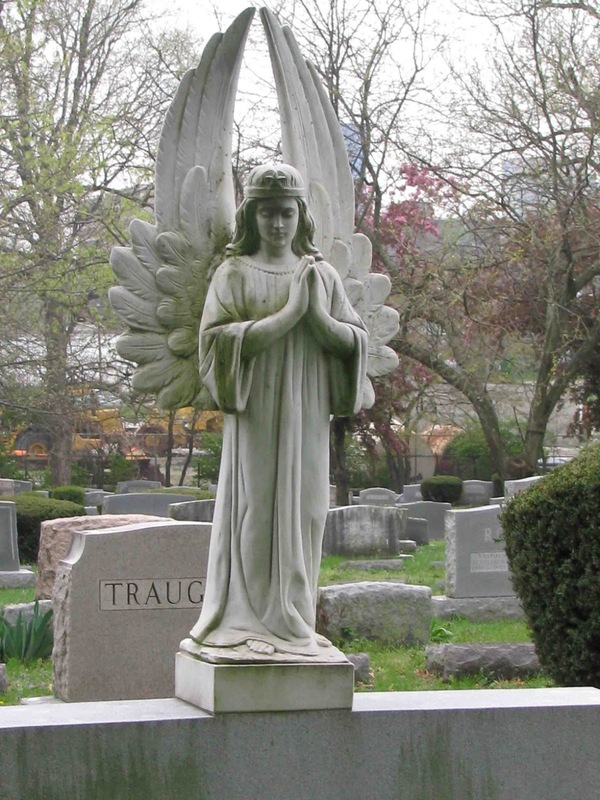 The acceptance of angels’ existence peaked during the Middle Ages and continued until the mid-19th century. Renewed interest has developed in the past 30 years. 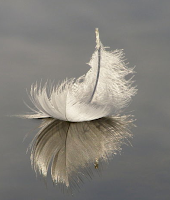 It is interesting that both religious and non-religious people believe in angels. According to several surveys conducted in 2009, 55% of Americans reported believing in angels. 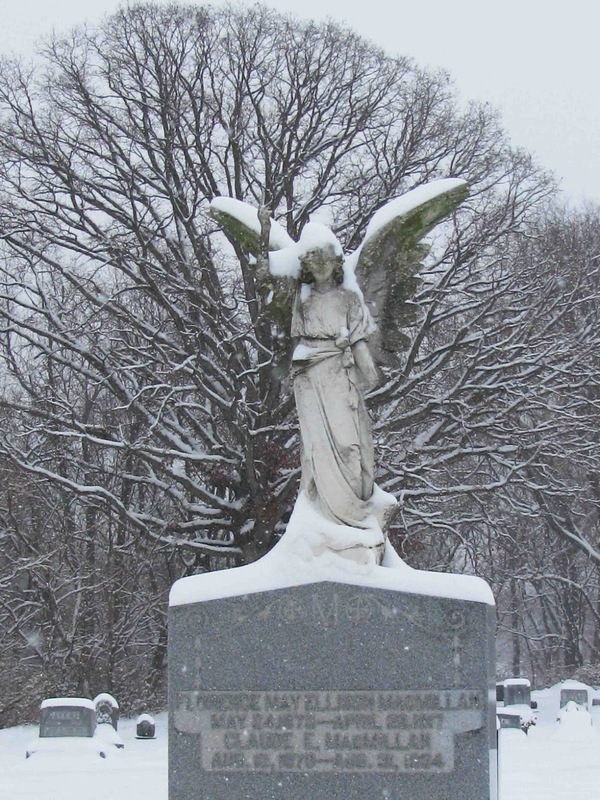 In Canada, over 67% of those polled said they believed in angels. 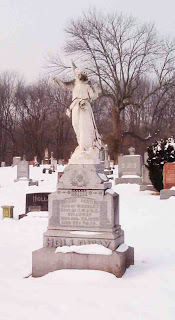 An angel pointing upward is leading the soul toward heaven and it’s reward. 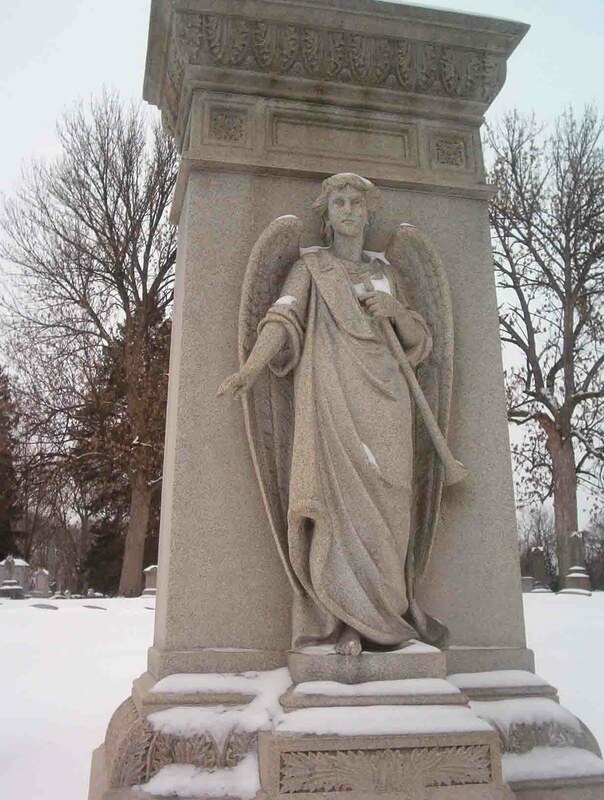 An angel with a trumpet represents the Archangel Gabriel who stands ready to issue the call to resurrection. 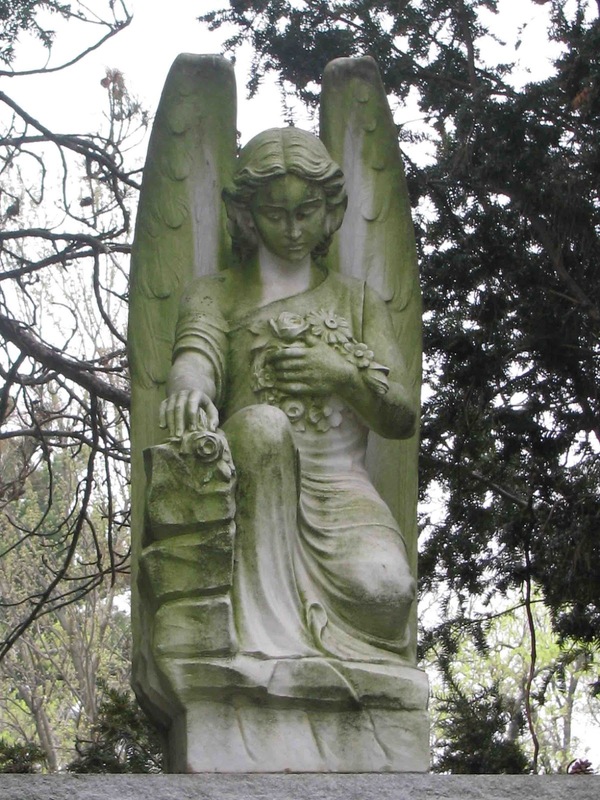 This angel holds flowers that indicate the death of a child. 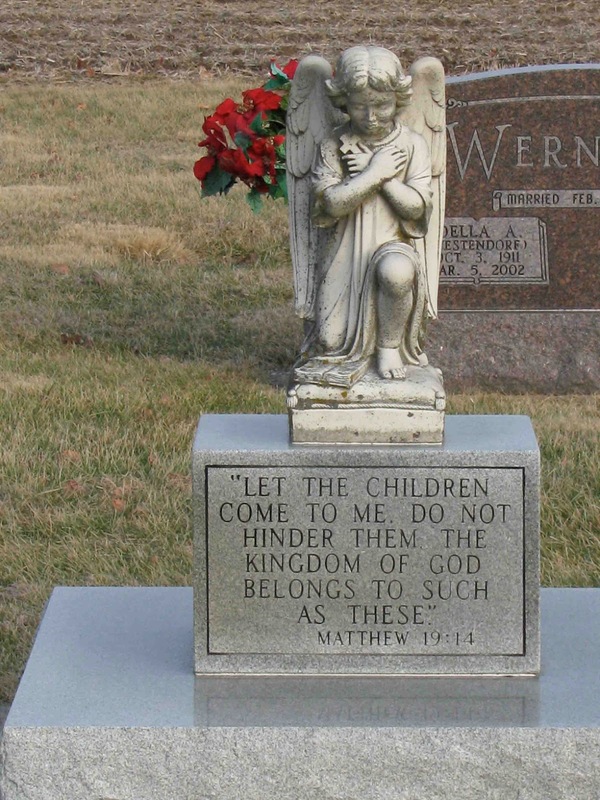 The daisies specify the innocence and purity of a child; the roses are an appeal to the Virgin Mary. Here the angel holds an extinguished torch, to indicate death. 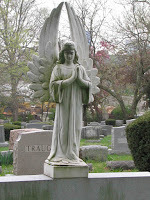 This angel stands in prayer. The star on her crown indicates the spirit rising to heaven. 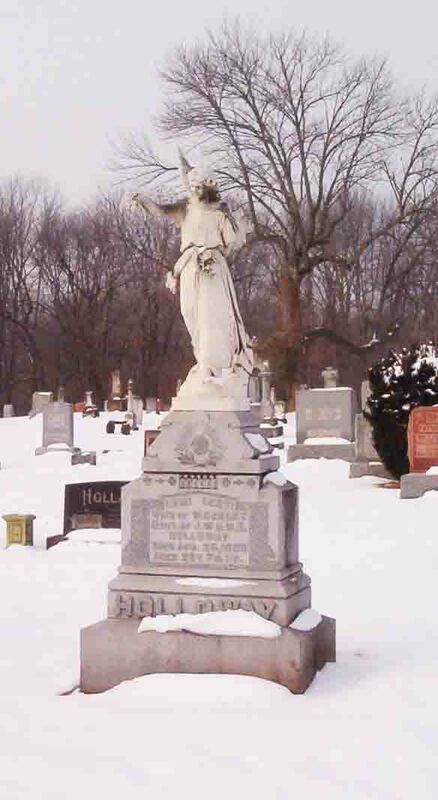 The crown represents victory over death. 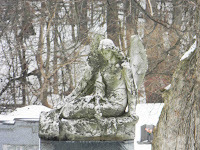 Here an angel sits on the grave, grieving an untimely death. 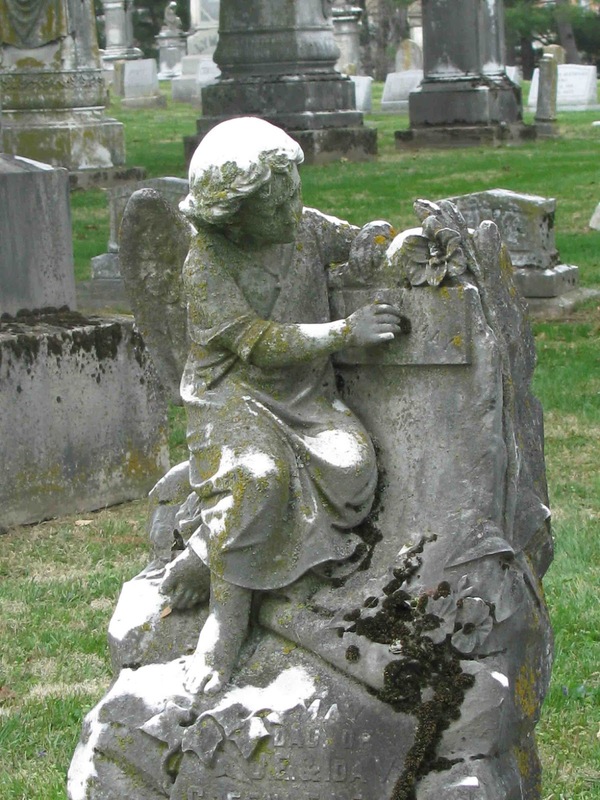 This angel holds a rolled up scroll in her hand to show that the deceased’s life has been recorded. 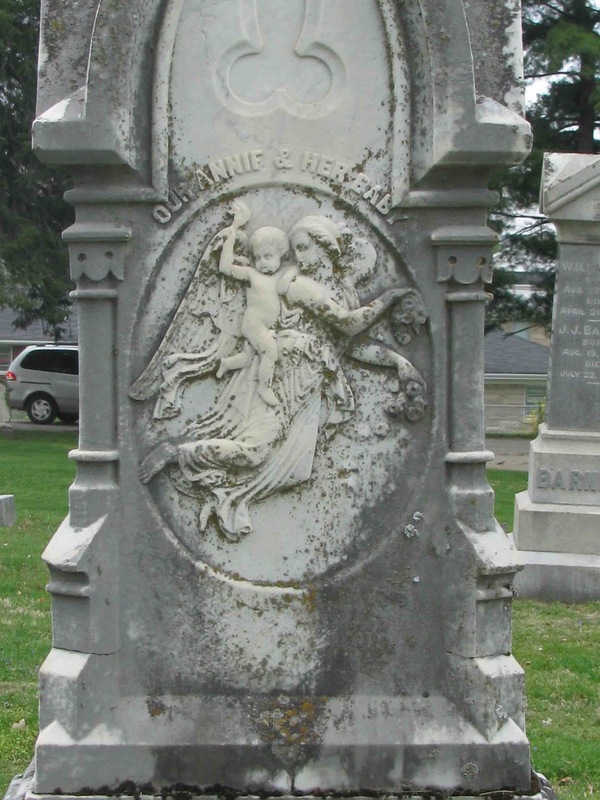 Here a guardian angel is taking the child to heaven. The baby is holding high a lit torch to signify life everlasting. 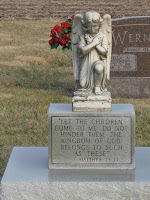 The roses in the angel’s hands indicate unfailing love. 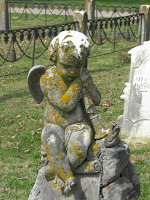 Cherubs are used to designate the grave of a child. Cherubs have actually been humanized and blurred with Putto, which are depicted as pudgy babies or toddlers with wings in Baroque artwork. 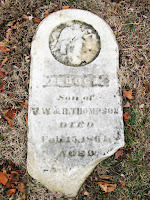 They are found on the gravestones of children and indicate the omnipresence of God. 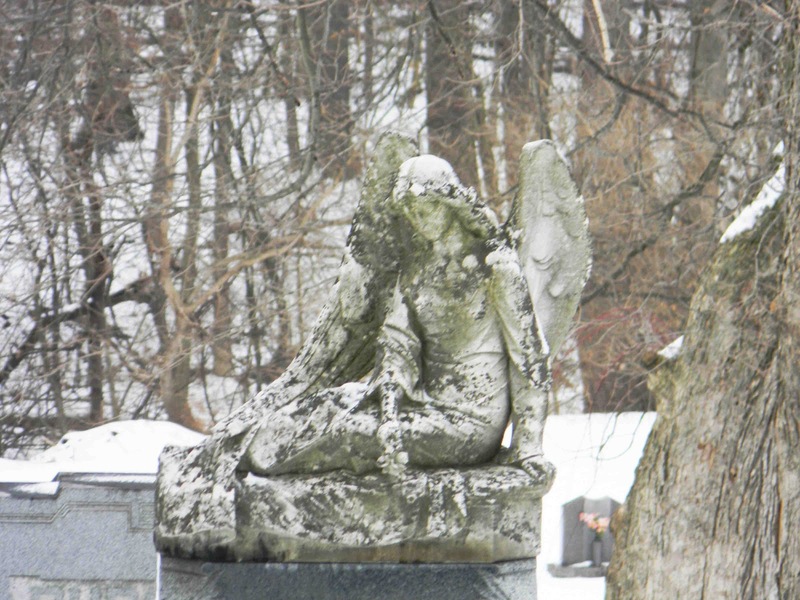 Here a cherub is sitting, grieving a child’s life cut short. 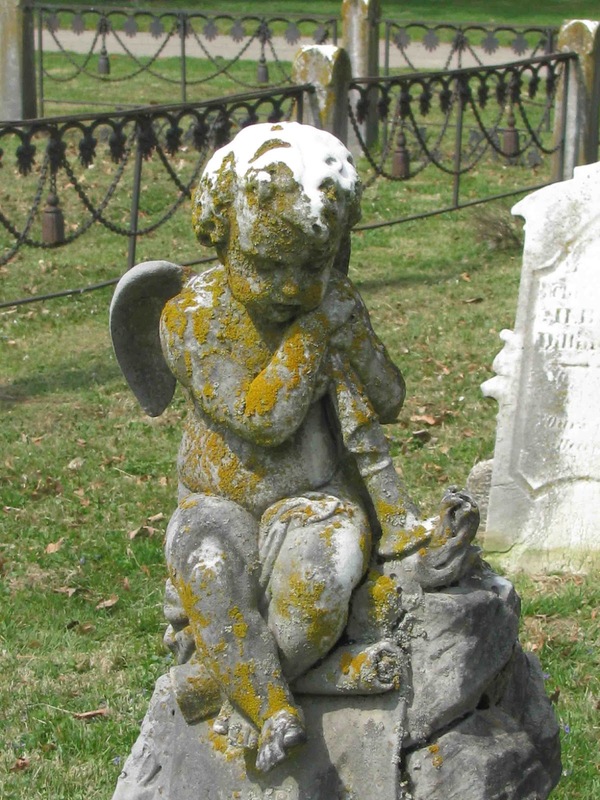 This cherub is erasing the name of the child who has passed on. 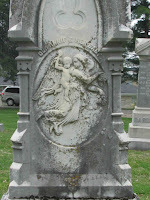 A cherub with an inverted torch indicating the death of a child. 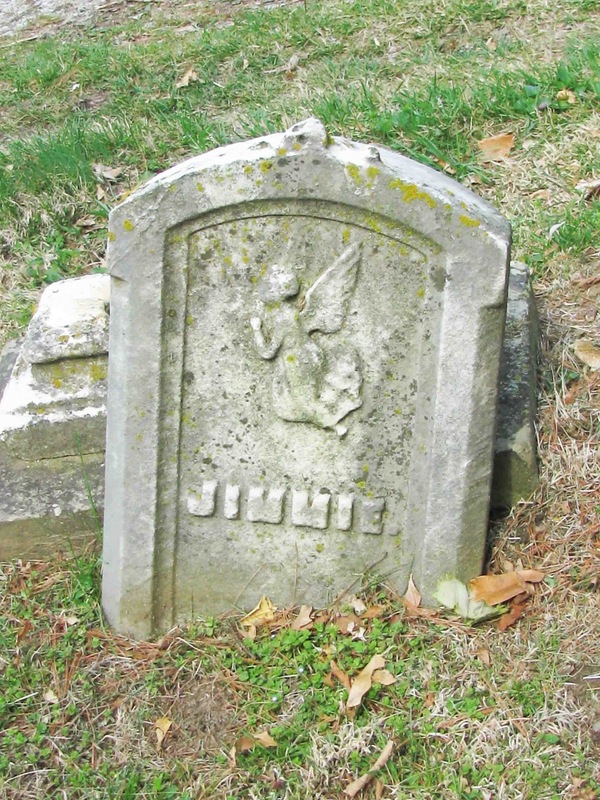 This small, flying angel proclaims rebirth. And this angel has fascinated me the most. 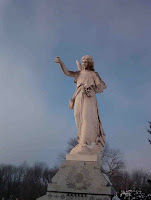 The laurel leaves on her head indicate triumph over death. But what is she dropping from her hand? Flowers? 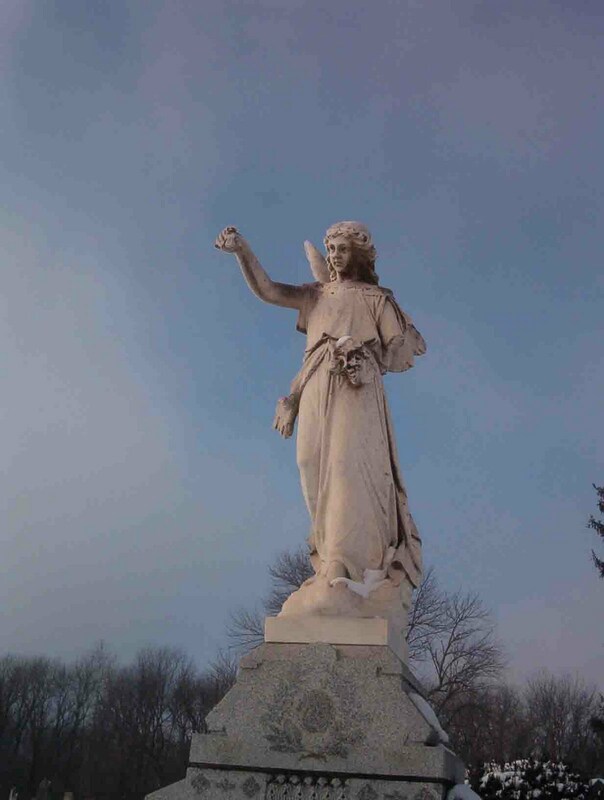 Also, here are two shots of the same statue, taken the same day. The angle is not that different, but it appears she has raised her head. This Friday is Arbor Day. I’ll have an interview with an international Arborist who will discuss those odd, interesting, sometimes spooky trees found in the cemetery. Great post. Love all of the examples! Great post. So many amazing pictures and information. Thanks for sharing. 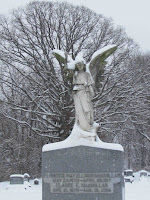 Thanks for sharing your angel pics. 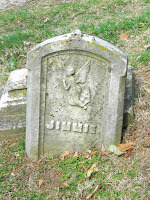 I love the Jimmie stone--understated and touching. Your blog description really resonated with me too, as I also do my blog for the very same reasons. Now I'm looking forward to reading some of your older posts and your new ones in the future. Simply gorgeous! I have always found cemeteries to be beautiful and peaceful places. So glad I found your blog! Thank you, everyone, for your kind words! 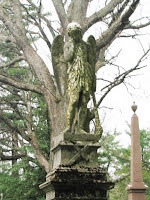 I've always been intrigued by the thought of angels, so this was a special blog to do. 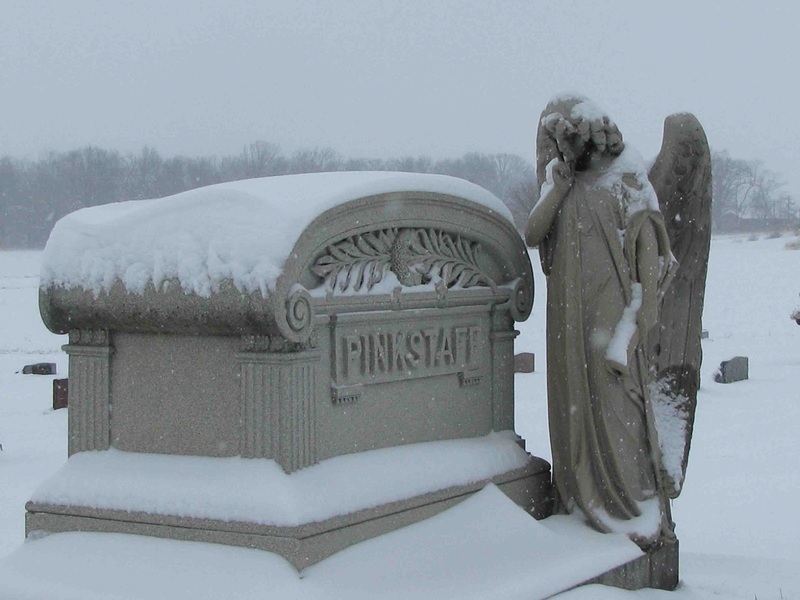 What about the angel that records the deceased's name in the book of life? ?